The laquearius gladiator or plurally know as the laquerii, these gladiators were similar to the retiarius, in that they looked to ensnare their foes and then attack. The laquearius was armed with a rope lasso and then a bladed weapon either a spear, sword or a pointard which was a shorter dagger like weapon. The laquearius could throw their lasso from distance, and look to wrap it round a head, limb or the whole body of their foe. Despite the existence of the laquearius gladiator it is truly unknown whether this class was a fully fledged gladiator in the sense of the retiarius or the murmillo. There is many rumour that that laquearius was something of a comedy act and was more for entertainment then true combat in the amphitheatre. With the lasso this gladiator would have likely had a harder time than the similarly armed retiarius, but not by a massive amount, leading me to believe that this gladiator was a true class, but more of a varient and invented later in the timeline of the Roman gladiators and therefore not as well documented in history. A model of the laquearius gladiator, here armed with spear and lasso. As ealier mentioned the laquearius was armed with either a spear, sword, a gladius, or a pointard, a shorter dagger. With the gladius there was more opportunity for this gladiator to fight in a more traditional sense, if armed with a shorter dagger it would almost force the laquearius to make sure they had actually caught their foe in their lasso before committing to a strike. For me the spear and the dagger seems to be the more likely weapons here, with a fully fledged sword putting them neck and neck against many other gladiators. With a spear and a dagger the fighting style would be much more varied. Again history has not provided us to much evidence on this class, but we believe they were similarly armoured to their brother class the retiarius gladiator. This meant the laquearius was armoured with an arm guard known as a galerus, this would have protected their throwing arm from attacks from their foes. The laquearius was nimble, agile and would move fast if attacked. With their lasso in one hand and their spear or dagger in the other, the laquearius was keen to keep distance between them and their foe. 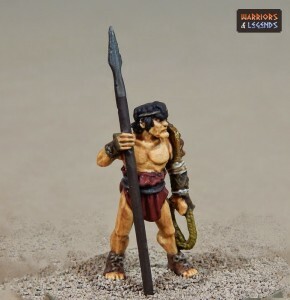 While other gladiators needed to be within striking range, the laqearius could stand as far away as the length of their lasso, giving them the opportunity to stand out of striking range. 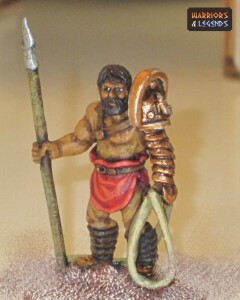 A model of a laquearius gladiator armed with their lasso. For an opponent of the laquearius, the goal would be to safely close the distance between them both. If they could get in close, the lasso of the laquearius would be rendered useless making it easy for them to go for the kill with their weapon. Ultimately the laquearius was always looking to land their lasso from long range, if they missed, step back or sideways and try again. If they caught them however, tighten the lasso, and move in carefully to strike. If their foe was still armed or capable of swinging, the laquearius could use the lasso to pull their opponent off balance, and make their chance of landing a strike less risky. Late to the gladiator amphitheatres, the laquearius were something of a rarity it seems. This gladiator similarly styled to the retiarius was not as present in the amphitheatre but likely offered similar levels of entertainment when they did. The crowd would be held in anticipation for the laqueariis lasso landing on their foe, and waiting to see exactly what would happen next in this battle.